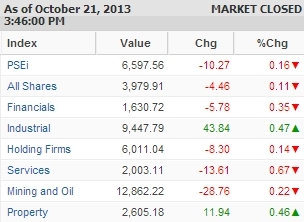 Manila—(PHStocks)—Philippine stocks retreated slightly Monday, 21 October, as investors locked in their gains. The mainboard Philippine Stock Exchange index (PSEi) slid by 0.16% or 10.27 points to close today’s trading at 6,597.56. Only the Industrials and Property sectors maintained their rally, gaining 0.47% and 0.46%, respectively. Leading the losers, on the other hand, was the Services segment, which declined just by 0.67%. The wider All Shares index, meanwhile, just slipped by 0.11%. Trading was moderate, with value turnover reaching PhP7.98 billion on 1.21 billion shares traded. There were 70 gainers against 77 losers, while 46 stocks were flat. According the PSE, foreign buying reached PhP4.86 billion while foreign selling was PhP5.04 billion. Today’s top most active stocks in terms of value include Philippine Long Distance Telephone Co. (TEL, PhP2,834.00, -0.77%), Ayala Land Inc. (ALI, PhP30.65, 0.49%), LT Group Inc. (LTG, PhP16.40, -2.84%), Metropolitan Bank & Trust Co. (MBT, PhP89.40, -2.83%), Ayala Corp. (AC, PhP615.50, -1.36%), Alliance Global Group Inc. (AGI, PhP26.65, 0.76%), Emperador Inc. (EMP, PhP11.68, -0.34%), Universal Robina Corp. (URC, PhP127.40, 2.17%), GT Capital Holdings Inc. (GTCAP, PhP884.50, 3.33%), and International Container Terminal Services Inc. (ICT, PhP105.00, -0.57%).